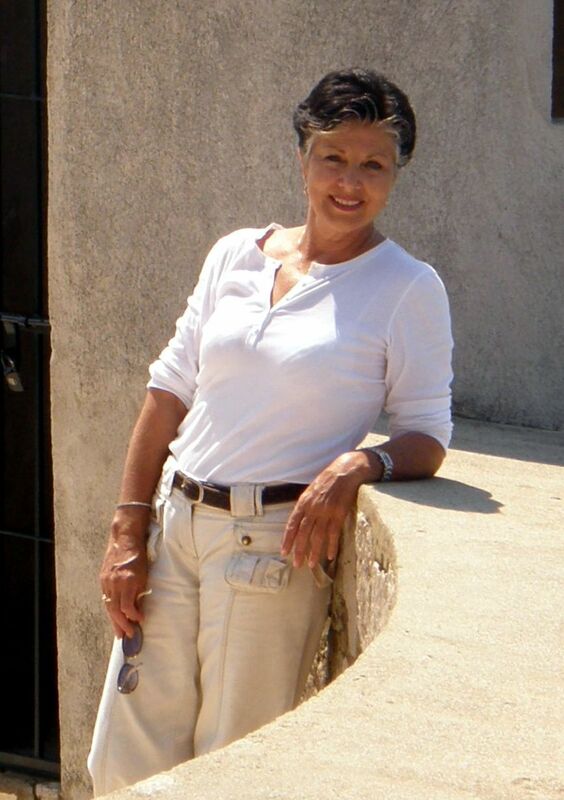 My friend Tea Brown from the Gold Coast in Australia, arrived on the Easyjet Flight from Rome into Split on 10th July. She had spent a couple of weeks in Tuscany and Sicily and I was so looking forward to seeing her and there she was, at 2.00pm, her flight was on perfect time, and Tea looking the epitome of style, sporting a beaming smile even though she had been travelling since early morning. She looked a million dollars…as usual! 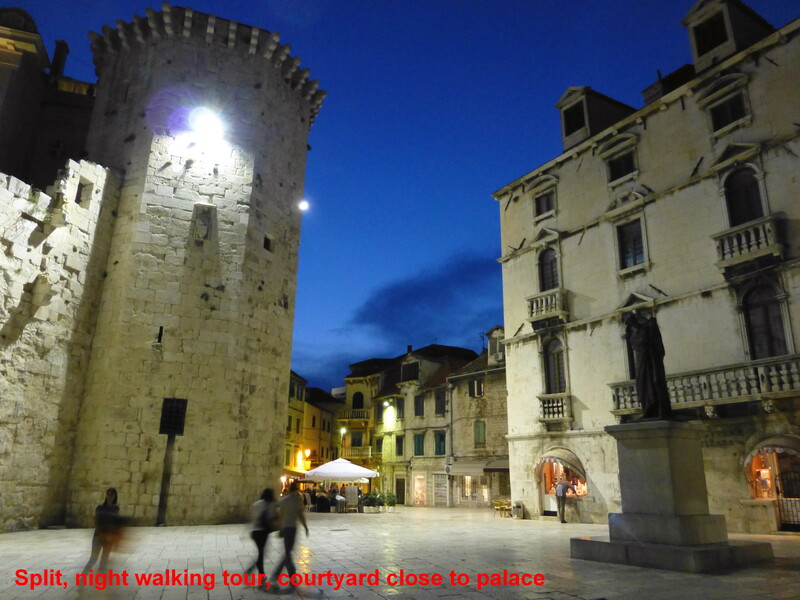 First stop was my apartment in Split…. It was her first visit to Croatia and she had no idea what was in store over the next seven days. I planned to take her to the Island of Hvar for a few days, then play the rest by ear, in other words, ‘go with the flow’. As we ventured out of the air conditioning, bags in tow, she was quickly stripping off a layer or two, and soon we were on our way to my apartment, dropping most of her luggage, re-packed a small bag of essentials, bikini, sun-screen, shorts and coolest gear…and off we went to catch the fast 5.00pm catamaran to Hvar. 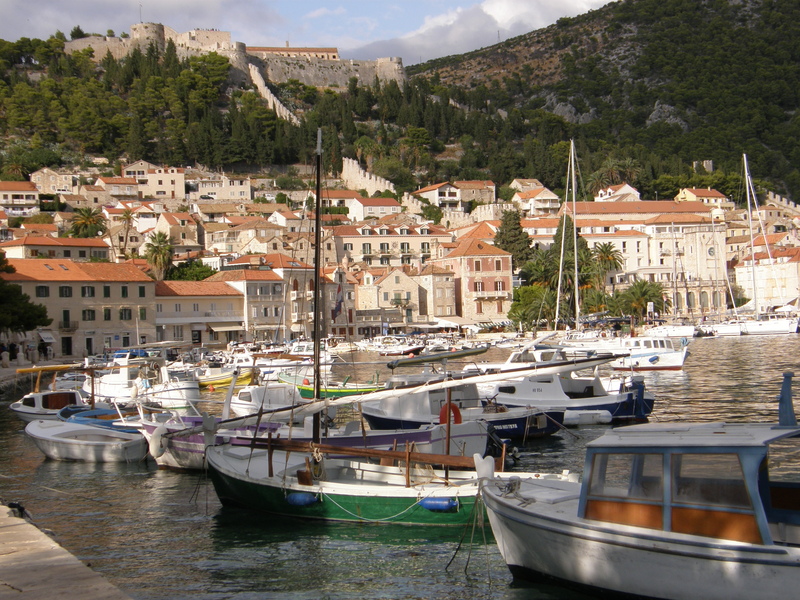 Arriving into Hvar Town Harbour is always such a pleasure, and particularly at that time of late afternoon. Our host, Anna Dujmovic, was there to meet us and transport us to our apartment located in a quieter location, by the sea, yet only a superb 10 minute stroll into the centre.We unpacked, and sat on our balcony admiring the view out towards the Pakleni Islands and beyond. 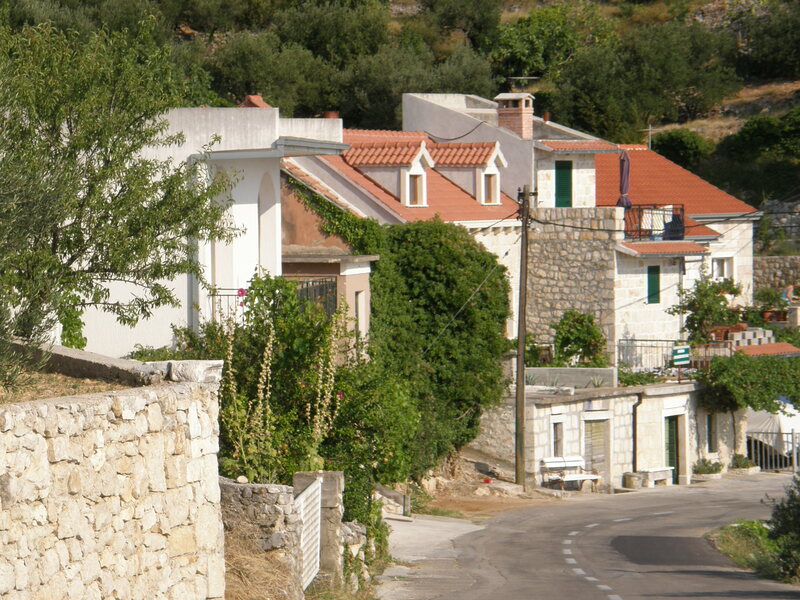 I have been to Hvar Town countless times and it never ceases to give me so much pleasure. The stone houses around and above the harbour with their terracotta rooves take on a beautiful golden glow as the sun is setting and the fortress overlooking the town is an awesome sight. The number of boats and ‘serious’ yachts in the harbour add to the scene, with a huge number of international visitors seated in the cafes and bars in the piazza, as well as the locals going around their business. We discovered Sanja Cirjak and Viktoria Vrzesnevskaija’s Madame Demode Boutique -See www.madamedemode.com and we spent a couple of hours trying, buying, and ooh -ahhing at their fabulous innovative creations. 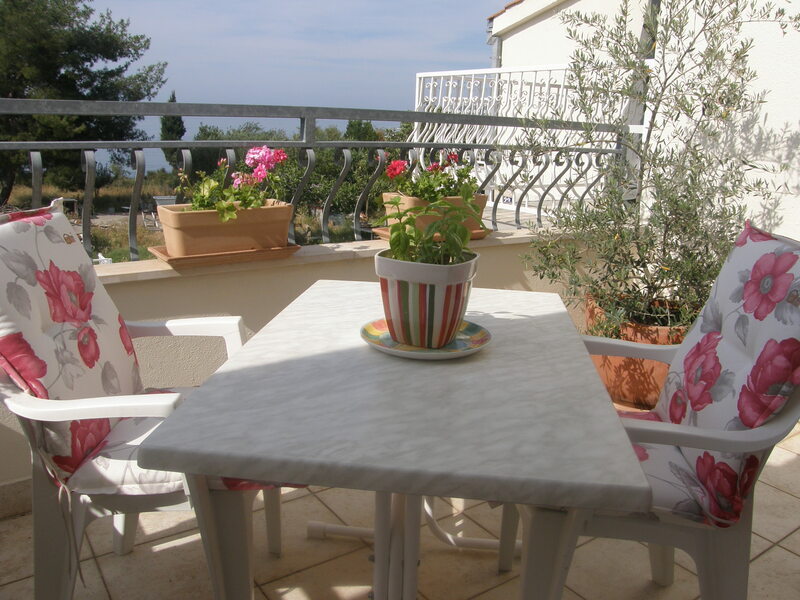 The girls have been designing together since 2004 and have stores both in Zagreb and Hvar town. 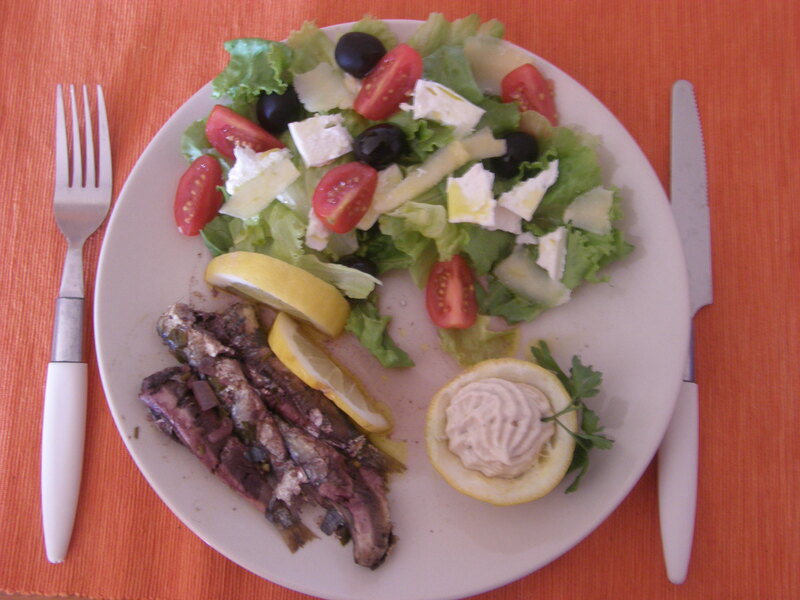 After showing Tea some of the sights and wandering through the atmospheric narrow streets, we were getting peckish and so I decided on one of my favourite restaurants, Palaca Paladini, Lucy Tudor’s well-known restaurant set in the ancient Paladini Palace. The indoor garden area is delightful; al-fresco dining in a gorgeous stone-walled area amongst orange trees on a couple of levels. They are well-known for their sea-food, but on this occasion, we chose the lamb, and both of us raved about it for days..so succulent, so tasty, and beautifully presented. 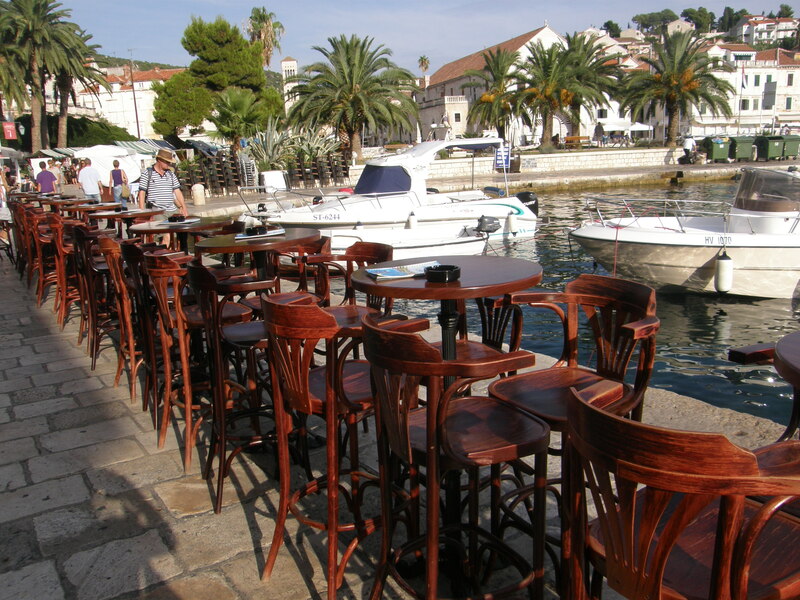 Tea was getting to like this place called Hvar…very much! Next day we were off for a swim, and found a perfect spot on a little pebbled beach. The water was an azure opal colour, and very clear and pristine. We had lots to chat about and took our time over the next couple of days lazing around and enjoying this idyllic island, it’s charming people, the shopping, the wines, and lots of great food. One of the highlights on Hvar was our evening at Konoba Luvije, hidden away up near the cathedral where Damir the waiter took great care of us until 1.00am in the morning..sitting on the terrace under the Dalmatian stars, the sights were so spectacular! On the 4th morning we decided it was time to make a move back to the mainland, so we packed and returned to Split, hired a car, and next morning took off driving 200 kms down the Dalmatian Coast to Dubrovnik. Tea decided she’d like to see what everyone was talking about…and she wasn’t disappointed! On the way we stopped for coffee in Makarska at one of my favourite coffee bars and really enjoyed coffee and whipped cream, plus a fresh croissant at Cafe Biokovo, sitting out overlooking the harbour under the shady plane trees and watched the passer’s by. The drive down the coast, was spectacular, and I detoured a little to show her the upper old village of Podgora where my late husband’s family is from, and where the sea views are stunning looking out over the islands towards Hvar, Brac, with the Peljasac Peninsula in the distance. Olive groves, fig trees, old stone houses, and vineyards, pomegrantes, rosemary and lavender, all combining in true Dalmatian style. We had booked accommodation at the Rixos Hotel in the Lapad area of Dubrovnik…and it was like a breath of fresh air, arriving into the spacious cool and inviting lounge reception area. Our room over-looked the sea, with pool, bar, and gardens below us. We stayed 2 nights and it was ample time to explore Dubrovnik, walked the walls, dined out at Komarda and Nautika Restaurants, savouring both the wonderful cuisine and the spectacular views. 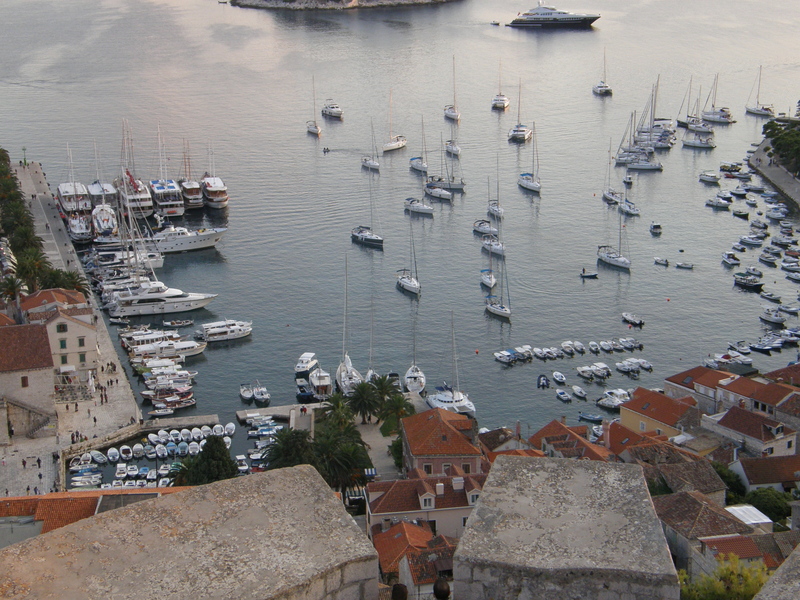 Tea loved Dubrovnik, and was so pleased to have the opportunity to see this spectacular walled city. 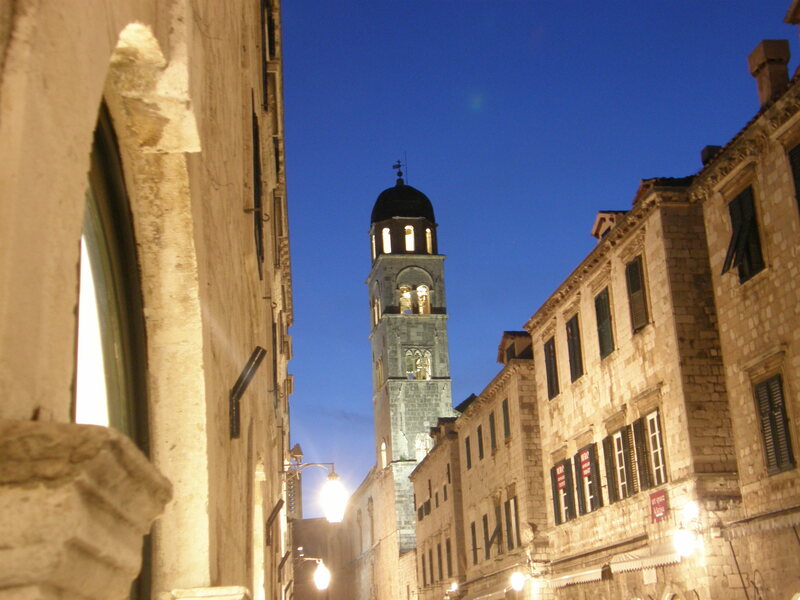 She commented on the friendliness of the people, not only in Dubrovnik, but throughout her week long stay. 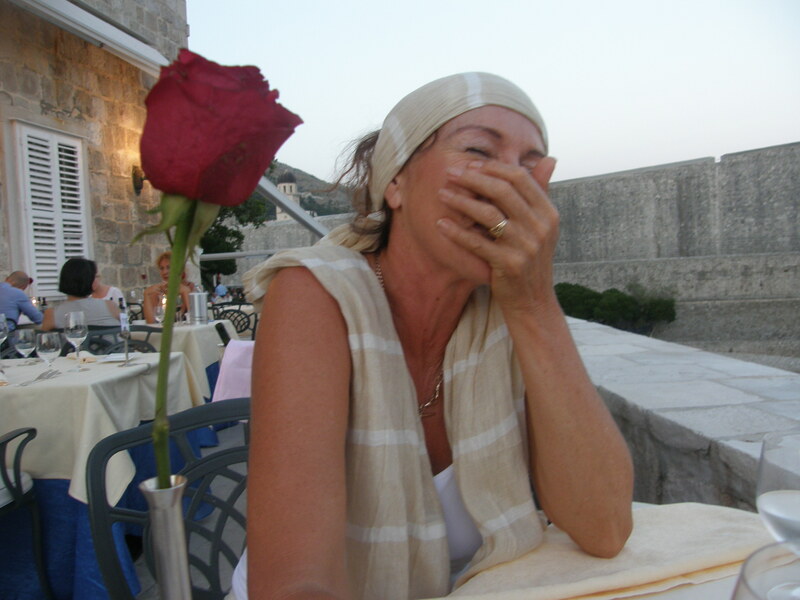 It was great to see her so relaxed….and having a good laugh…. 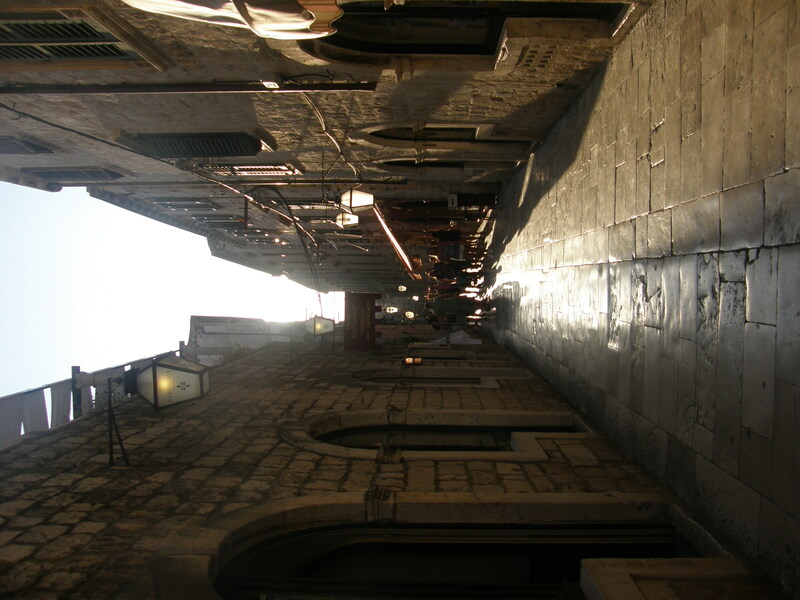 One of my favourite streets in Dubrovnik…..love the paved walk-ways…beautiful…. Heading back to Split, we took the new inland highway and travelled through Vrgorac and really enjoyed the majestic scenery along the way. Arriving into Split mid afternoon after a coffee and strudel at Luxor Cafe we hit the shops, with Tea revelling in some of the fantastic Italian shoes, bags, and exquisite Croatian designer wear boutiques. I enjoyed watching her happily twirling around in silks and and some of the most creative designs that she wears so well. One place I had to take her was the Ethno Museum in the Diocletian Palace, and I’m so glad we made the effort on her final evening! The displays of colourful national costumes, finest of handmade laces and jewellery are stunning and Tea was so thankful to have had this opportunity. Time was running out, so we decided to head for the Figa Food Bar, set amongst the walls within the Diocletian Palace, and we ordered a seafood risotto, a salad, simple and light, and I thought it was an occasion to order a bottle of Dingac Barrique…from the Peljasac Peninsula, one of Croatia’s best red wines. Needless to say, we managed to finish the whole bottle between us, and enjoyed the setting, the service, the smiles, and chit chat around us…and the music! 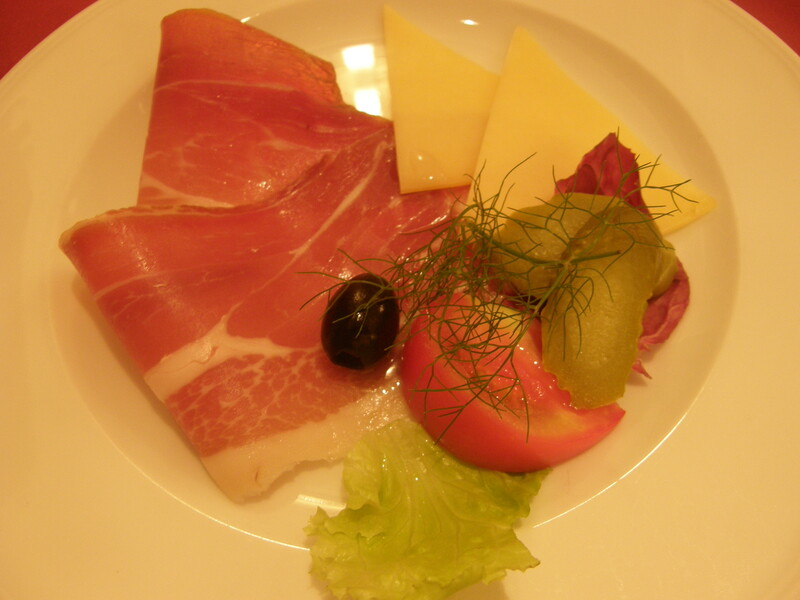 It was the close of a lovely week with a special friend….here in Croatia.